Pete Seda, the founder of an Islamic charity in Oregon, funneled $130,000 to an organization that required its graduates to commit acts of terrorism, a previously unreleased interview with a former Russian Federal Security Service operative shows. The new details into Seda's financial dealings and his leadership of the now defunct al Haramain Islamic Foundation were revealed in a sentencing memorandum filed Wednesday by the government. Seda was convicted in September of filing false tax returns connected to his funneling money to Chechen mujahedeen and is scheduled to be sentenced Tuesday. The report, an interview with Sergey Nikolayevich Ignatchenko, sheds light on the ultimate destination of $130,000 that Seda said was charitable aid. In asking a federal judge to apply a "terrorism enhancement," the government is seeking an eight-year sentence for Seda. According to evidence entered during a week-long trial this past summer, Seda accepted a large donation intended to support "our Muslim brothers in Chychnia," and then surreptitiously shifted the money to Saudi Arabia in the form of difficult-to-trace traveler's checks. During the trial, officials described how they lost track of the money when it was deposited in Saudi Arabia, but that they suspected it eventually made its way into the hands of Chechen rebels. Rather than attempt to prove Seda was directly financing terrorism, prosecutors brought charges that he had conspired to move money out of the United States without reporting it and tax evasion. Although not admitted at trial, the testimony of Ignatchenko at sentencing is expected to show that the end recipient of Seda's money was Chechen mujahedeen. The money was reportedly transferred from Seda to co-defendant Soliman al-Buthe and then into the hands of the head of the Kavkaz Institute, "a school to propagate radical Islam, including religious instruction and combat training." According to the sentencing memo, '"Graduates' of the Institute were required to commit an act of terrorism upon leaving the camp." From the United States to Saudi Arabia to Russia, employees of al-Haramain raised and transferred money under the guise of humanitarian aid. "We need hospitals to be set up, medications and medical equipment to be delivered, and the wounded to be transferred to Georgia," al-Haramain representative Abdallah Latif reportedly told potential donors. Once the money was donated, however, it was immediately clear who the true recipients of the aid were. "Officially, the funds were intended for religious events of Muslim holiday celebrations," Ignatchenko explains. In reality, he says "the money was used to support terrorist organizations—to purchase weapons, uniforms, medicine, communications devices, vehicles, and to pay religious extremists' salaries." In the rare circumstances in which the money went to provide medical facilities and treatment, even that was done with the intention of supporting the jihad against Russian forces. "Al-Haramain took special care of wounded militants, and provided medical treatments to have them back on the front lines as soon as possible. To make this happen hospitals were set up, money, medical professionals and medications were sent to Chechnya and countries bordering Russia," Ignatchenko said. Account ledgers back up Ignatchenko's claims, indicating that while money was indeed spent on medical supplies and treatment, weapons and ammunition are also line items. The release of these confiscated records goes directly to the purpose behind terrorist financing laws—that money is fungible. Indeed, these first-hand accounts demonstrate that terrorist groups don't maintain separate accounts for their violent and "charitable" activities. 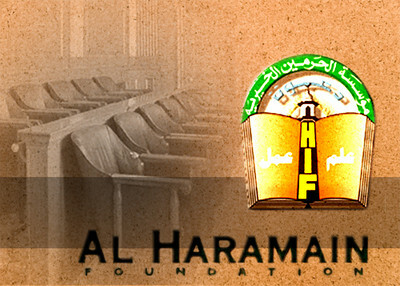 Although al-Haramain's support for terrorists from al-Qaida to Chechen mujahedeen is well-documented, the court records provide new details of the frequent communications and coordination between the "charity" and terrorist organizations. In January 2000, Salih al-Din, an employee of al-Haramain reportedly spoke with Chechen commanders. He sought out information about Russian activities in Grozney, particularly identifying numbers of military units and subunits conducting warfare. "BBC and CNN are willingly using the materials you presented," al-Din explained. "Even the infidels in America say that they want to help Chechens fight Russians when they watch our footage." In revealing these new details, the government shows how Seda's attempts to hide the true recipients of aid were part of a larger tactic of al Haramain in Saudi Arabia. "The leaders of al Haramain didn't want to expose their improper activities, but did not decline the cooperation of Chechen militants either," said Ignatchenko. The organization simply structured its transactions to avoid any scrutiny. "Al-Haramain will provide assistance in small installments to avoid accusations of supporting Jihad," a representative of al Haramain said. Several days later, a new message read "Right now, al-Haramain has 50 million dollars designated specifically for mujahidins." See the Investigative Project on Terrorism's coverage of United States v. Seda here, here, here, and here. This is an explosive filing. Wow. IPT: Thank you so very much for all your work in publicizing and cataloging information on this case and so (too) many others. You provide an outstanding and essential service. Your site helped me greatly to understand the nature of the evidence against Seda and to refute the gloss of his supporters. I refer directly to your site for conclusive evidential links. It was by reading the indictment on your site, and seeing the trophy photo of executed bound Russian POWs from his computer, that I learned the ugly truth and my red flag went up. Now others will see the fuller evidence that my intuition and gut hinted at... will they reconsider their support for Seda now? The money went directly to a Chechen terrorist training camp. He knew the money went to terrorists. He talked about joining the battle. He signed the travelers checks. He lied in the IRS filing to cover it up. He fled the country to avoid arrest and charges. 8 years is justified, if not more. he has blood on his wallet, if not on his hands. We will never know how many died because of the money he transfered. He talked about joining the battle. Wow.